Guerilla Toss is back with a brand new EP which might be their most accessible to date. Of course, this is Guerilla Toss, so even their most accessible isn't very. It starts off with "Realistic Rabbit," which features Kassie Carlson actually singing. It's a swirling mess that's beautiful in an odd sort of way. It's the audio equivalent of getting a tattoo: Sure it hurts, but it's not as painful as you expected and it's actually kind of nice in its own way. "Ritual In Light" is almost chill and is funky as hell. "Polly's Crystal" is a bizarre blend of jam band and post punk, which I never thought I'd compare a band to but it makes so much sense. 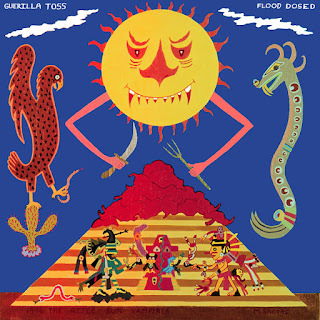 The new Guerilla Toss EP, Flood Dosed, is due out on September 25. You can stream it and pre-order it (including a cassette version) on their Bandcamp. Listen to ""Realistic Rabbit" below, and below that are their current tour dates.